As an alumnus of Sale Grammar School, we welcome you to share your memories of your time at the school. How was your first day in a 'big' school? Perhaps a certain teacher inspired you. Or perhaps you are now inspiring others. This is YOUR space to share those treasured moments at school or to request a message to share. If you would like a message to be posted on this page, please submit it using the 'contact us' alumni page. 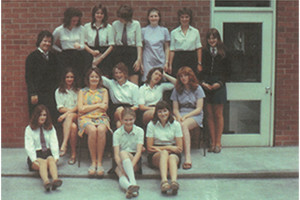 Mrs Caroline Enderby (nee Monk) has been in touch and is hoping to organise a reunion for 'old girls' from class 5A, or indeed any girls who left in 1970/71. In her own words she writes "We will all be celebrating our 60th birthdays and most of us will not have seen each other since leaving school so it should prove to be very interesting." 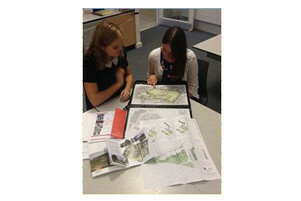 Former Sale Grammar School students Danielle Bentley generously gave her time to discuss the finer details of being a landscape architect with sixthform Art student Bebe Freeman. Danielle enjoys her successful career in landscape architecture, having studied at MMU. She currently works for Randall Thorp (www.randallthorp.co.uk) in Manchester and enjoys working on large scale contract projects nationwide. Former Sixth Form student, Harriet Edwards, who, after leaving us, completed an Art Foundation followed by a degree, has won a student film competition. Harriet flew to LA and started work immediately. She's been finding her way around on the buses and getting to know the area. Take a look at the Insight Film Festival announcement here. Talented stop frame animator Meg Houghton-Gilmour maintains her creative genius with some new additions to her you tube channel. Meg amazed Art teachers at Sale Grammar when she began producing animations as a GCSE Art project. She has gone from strength to strength during her time at university. To see meg's channel, click here.